#151: A Musician’s Resume | mark Joseph "young"
This is mark Joseph “young” blog entry #151, on the subject of A Musician’s Resume. I am a musician–always have been, a music major in high school, my kindergarten teacher dubbed me her “little songbird”, and I tell people that English is my second language. I am good at it (I do not believe God intends for us to denigrate our abilities by lying)–but I don’t get as many opportunities to do something with it as I would like. I belong to several online Christian musician groups, and periodically I see notices seeking someone for a band. I am always a bit hesitant as to how to respond to these. For one thing, I am particularly bad at self-promotion and do not like to do it; for another, I have sometimes been rejected without explanation or, worse, completely ignored, and that hurts. (Rejected with an explanation is always better, even if the explanation is offensive.) Beyond that, well, when you have as much experience in the Christian music field as I have, you also have a lot of questions going into just about any opportunity. Sometimes I think that the people trying to form bands haven’t really thought through any of it, and the questions confuse them. So to resolve all of these matters, I decided I would put details about my experience, abilities, and hopes here, and in future refer people here who want to know more about me. Communicate my availability to any band looking for someone with one or more of my talents. While those goals are not completely compatible, they overlap sufficiently that three separate pages would be highly redundant. Thus there is much here that is of no interest to persons in connection with any one of those, but hopefully everything that any of them would want to know is here. It seemed best to begin with a list of bands in which I have been a member, and what my part in it was. I am undoubtedly omitting a number of them, but the list is extensive even so. I fronted for all of these, but always shared the position with other members of the band. The Last Psalm, evangelism pop-rock band; founder, director, arranger, primary composer, lead and supporting vocals, electric rhythm and second lead guitars, keyboards. The Agape Singers, Luther College official ministry and promotional ensemble; student director, soloist and supporting vocals, acoustic guitar, bass guitar, contributing composer/arranger. Jacob’s Well, pop-rock band with unfocused ministry for playing local coffeehouses; contributing composer/arranger, lead and supporting vocals, bass guitar. Aurora, formed to support evangelistic outreach meetings; contributing composer/arranger, supporting vocals, bass guitar. Topsfield Fair Evangelism Band, semi-official Gordon College ministry band formed for evangelistic support; contributing composer/arranger, lead and supporting vocals, bass guitar. TerraNova, evangelism pop/rock band; director, arranger, primary composer, lead and supporting vocals, electric rhythm and second lead guitars, second bass guitar, saxophone. Cardiac Output, teaching ministry band; founder, director, arranger, composer, lead and supporting vocals, electric rhythm and lead guitar. 7dB, unofficial worship band at the Seventh Day Baptist Church of Shiloh which was exploring other ministry directions; co-founder, co-director, arranger, contributing composer, supporting vocals, third guitar (rhythm, lead, and impact), second bass guitar, keyboards, flute. Collision, evangelism rock band arising from 7dB dissolution; co-founder, director, arranger, primary composer, lead and supporting vocals, instruments as 7dB but eventually moving to bass guitar only. Silver Lake Community Church Worship Band, not ever really given a name, I was asked to help the worship leader organize musicians for leading music in services; directed as a vehicle of teaching him to direct, supporting vocals, bass guitar, rhythm and lead guitars, piano. I have also done a substantial amount of solo work, and filled in as requested in other bands, most recently on lead/rhythm guitar or bass guitar for several of the monthly Relentless worship services at the Bridgeton Assembly of God church. 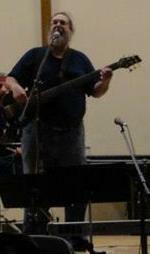 As a composer, I have written hundreds of songs in many styles, from choral to rock to country to jazz. Dozens of these are still in my repertoire. I tend to write when I have the opportunity to perform, crafting songs to fit the available ensemble. I generally have avoided doing covers without a good reason (I consider audience participation a valid reason), and so as an arranger I have always found a way to make any song significantly different from the original. I am particularly good with vocals, having worked with as many as six parts or as few as two. My vocals are tenor–I was first tenor in New Jersey All-state Chorus twice, and have had voice classes and lessons including a session with one of the top voice teachers in the country; I have coached voice. My comfortable range runs from low C (middle of bass clef) to high A (middle of treble clef); my effectively useful range extends maybe a minor third above that, a fifth below it. I am very good on pitch and blend, and can keep a part well enough that if someone else loses theirs I can jump to it to put them right and then return to mine. Some people rave about my bass guitar playing; it seems easy to me, except when I have to play a complicated part and sing a different complicated part at the same time. I manage. I have played several different kinds of bass guitars over the decades, but currently own a Carlo Robelli six-string which I tune to B Standard; I probably have access to a four-string acoustic bass guitar if needed. I am an excellent rhythm guitarist who can name any chord you can play and probably play any chord you can name. I finger pick and chord frill easily and understand how the position of the chord can impact the flavor of the music. I am a passable lead guitarist who prefers to let someone else do the lead work and coach them if they need it, providing second lead support for double leads, back-and-forths, and similar passages. I have never been able to find (or afford) effects boxes that I liked/could use, but I have done some cry off the guitar itself, and designed and built a channel changer box I use to switch to a louder channel on the amplifier as needed. I have or have access to several electric guitars, none of them noteworthy, and one non-electrified acoustic guitar. I consider my keyboards playing passable, useful for a band that doesn’t need a full-on keyboard player but wants keyboards for occasional use. I’ve taught beginner piano and coached more experienced players in understanding different keyboarding styles; I write keyboard parts when necessary for a particular player to capture a particular sound. Some of my songs were written on and for the piano as the primary instrument. As to other instruments, flute and saxophone have been mentioned, and there are a score of others I have played and could play again. My saxophone is badly in need of repair, but I have access to flute, violin, viola, ocarina, dulcimer, and probably other instruments I’m not remembering. If you hand me an instrument I’ve never seen before, within an hour I will play you a song I wrote for it. I’ve done it with the fife, tin whistle, recorder, dulcimer, and several other instruments. I am no longer very good at tuba and don’t have one, and my trumpet playing has never been good and the trumpet needs repair, but if you’re looking for someone who can fill in with odd instruments, I probably fit the bill. As mentioned, I have or have access to a six-string bass, a couple of six-string guitars, a flute, and several other miscellaneous instruments; I also have access to a midi keyboard (seventy-six keys). I have several amplifiers and quite a few speakers, a few low-end microphones, a sixteen channel mixing board, and miscellaneous equipment such as cables and mic stands. I also have a sound guy who will probably come with me (Hi, Mike) who has a fair amount of equipment as well, and knows people from whom he can borrow more. I have written extensively about the relationship between music and ministry in previous entries on this web log; I have included a list of relevant articles at the end. My own ministry is specifically that of teacher. Although I would hope that would be integrated into whatever is ahead, I have long considered evangelistic bands very important and have worked with many, and I have also worked with pastoral/worship ministry bands. If I’m joining your band, I’m supporting your ministry. All of the previously mentioned bands were ministry bands. I have undergraduate degrees in Biblical Studies from Luther College of the Bible and Liberal Arts (formerly) in Teaneck, NJ, and Gordon College in Wenham, MA (plus a Juris Doctore from Widener University School of Law, and a lapsed membership in Mensa). For about the past two decades I have been the Chaplain of the Christian Gamers Guild, an international interdenominational Christian organization; I have published several books on Christian life, most famously Faith and Gaming about integrating our leisure activities with our Christianity. I taught Biblical Studies at a fledgeling Bible College in Pitman, and continue to do so online through the auspices of the Christian Gamers Guild. I was an on-air personality on one of the nation’s leading Contemporary Christian Radio stations for half a decade, where I interviewed many artists and others in the Christian music industry, taught Bible online, and otherwise ministered to the listeners. I have done a lot of solo work, and am certainly willing to sing and play solo anywhere that wants me. It is not what I prefer for two primary reasons. The more important is that it is so limiting, because there is only so much one person who is not able to use computer-generated musical accompaniment can do alone on stage. The lesser is that I don’t like to feel like I’m putting myself forward, so I insist on sharing the stage and the spotlight with others. I have long told my band members that everyone in the band is there to make everyone else in the band look good, not to worry about how they themselves look because that’s the responsibility of everyone else in the band. It’s easier to do that if there’s actually a band, and I’m not alone in the spotlight. When I do solo appearances, I try to include some time teaching, because that is ultimately my ministry. If I “had my druthers, I’druther” reform Collision. For one thing, the band has a name and a following including an extant album. For another, I like the concept, the minstry purposes, the goals. But I’m not wedded to this, and if someone is interested in including me in whatever ministry they are doing, that’s something I will seriously consider. The vision for Collision is to be the band people tell other people they need to hear, to do music that is on the rock side of contemporary, and to use it to proclaim the gospel as an evangelistic outreach. My expectations are that everyone plays an instrument; I’d like several vocalists, but understand that not everyone can sing. The ideal instrumentation was conceived as lead guitar, rhythm guitar, bass guitar, drums, and a “fifth instrument” that floats between keyboards and other instruments as needed; at our height we replaced the rhythm guitar with keyboards quite well, and lost the fifth instrument, but ran two voices (we were adding a rhythm guitar/vocalist just before we started losing people). Again, though, it’s flexible: if the Lord provides a different collection of musicians, that’s what we will use. I expect that any Christian band will have some ministry purpose, and will have some understanding of what that purpose is, sufficient to articulate it to me. I am getting old and have had two hernia operations; I can’t easily roadie the heavy equipment anymore, although I do have a hand truck to help with that. I also struggle with asthma, and so have to avoid smoke, dust, and pollen as much as possible so I can keep breathing. It also limits my physical exertions somewhat, but not as much as it might. I am terrible at self-promotion. I am not a salesman. I do not have a space for a band to practice. Collision practiced in my living room when we did not have a drummer, but with the drummer we had to set up on the front deck, which is very much weather-sensitive. Whatever we do, we will have to practice somewhere else. I am located just outside Bridgeton, New Jersey (Hopewell Township), a stone’s throw from the Delaware Bay if you’re Sandy Kofax. I can get transportation, but probably can’t travel much farther than an hour for weekly rehearsals, less for more frequent ones. Otherwise, my schedule can be kept fairly open, and I can almost always be where I promise to be (e.g., barring medical emergencies and transportation failures). I expect that I would be able to arrange to tour, if the tour was going to pay for itself. I have worked with seasoned professionals, and have trained rank amateurs, and am open to discussing options with anyone who thinks I might be good for whatever they are doing, or that they might like to work with me. Where and when do you expect to practice? What kind of music are you doing, and are you open to including compositions by the members? What is your sense of your ministry, your ministry goals? What are your hopes for the band’s future–are you wanting to stay local, hoping to go national, or what? How is the band organized–is there one person who makes all the decisions, or two or three people who are in charge jointly, or is it the theory that all the members participate in all the decisions? Or indeed, are different aspects overseen by different members–one musical director, one financial manager, one booking agent, and so forth? So if you think I’m your guy, be ready to answer those questions and get in touch with me. #75: Musical Influences considers the artists who have had the most impact on my style. #95: Music Ministry Disconnect prefaces a series on music ministries by explaining that not all Christians who are musicians are necessarily in music ministry. #97: Ministry Calling discusses how to recognize whether you are called to ministry. #98: What Is a Minister? explains the five types of ministries listed in Ephesians 4. #99: Music Ministry of an Apostle explains what apostolic ministry really is, and how music might fit into such a ministry. #101: Prophetic Music Ministry attempts to compile what we know about New Testament prophets and how that might relate to the use of music. #102: Music and the Evangelist Ministry shows how music is used by evangelists. #103: Music Ministry of the Pastor describes the pastoral use of music, with some attention particularly to worship music. #106: The Teacher Music Ministry, my own calling, is explained with reference to the use of music. #107: Miscellaneous Music Ministries concludes the series with a discussion of how music might be used to minister outside of these callings. #109: Simple Songs talks about why worship music tends to be simplistic, as part of the purpose of that ministry. 1 I use the word “fronted” to mean that I would speak to the audience, such as introducing songs and band members; it also usually included sharing some teaching or testimony. 2 When I perform solo I usually play an acoustic guitar and/or an acoustic piano if one is available on site; I sometimes play an electric guitar and/or electric piano. 3 The school was named The Institute of the Great Commission, and was started by a local church named The Rock; I taught one term, but then a church split undercut the funding and the school laid off half of the four-member faculty. 4 WNNN-FM, licensed to Canton, NJ, with studios in Salem. Sometime in the late 1970s it was reportedly number twelve on a list of such stations, and when I was program director I was informed by one of the major label radio relations people that we were one of the fifty stations she contacted every week. It was sold and pirated for parts a few years after my departure. 5 My teaching is readily available on many posts on this web log, but #121: The Christian and the Law is particularly significant as an example of a teaching from a concert, and #88: Sheep and Goats as something I taught at a service which was not a concert.